Trick by Ltd. ATTO Co.
$17.95 In stock. Order in the next 17 hours, 28 minutes and it will go out today! Ever buy one of those Pop-Up birthday cards? When you open it, a 3D paper object forms right before your very eyes. “Birthday Surprise” builds that magical moment into a playing card. 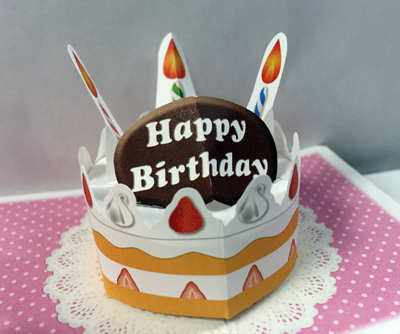 You use the gimmicked card to make 3D pop-up birthday cake appear on a selected playing card. This is the ultimate birthday card trick – for kids as well as adults. Check out the video. You get a sturdy, well-made, red-backed Bicycle Card with the pop-up birthday cake built in. There are no special moves. Just unfold the flap and the 3D cake appears, complete with candles and the words, “Happy Birthday!” There are so many great ways to use this. Force the “Birthday Surprise” card. Say, “You didn’t pick a playing card. You picked a birthday card!” Ha ha! Get it? Unfold the flap and their eyes will pop as the 3D birthday cake appears. Make a very short video of you opening the card saying “Happy Birthday” and post it to Social Media on your friend’s birthday. Doing an upscale party where you’re being paid very well? Perform “Birthday Surprise” and give the card to the birthday boy to keep. Birthdays are pretty special occasions. If you’re looking for a way to make someone’s birthday magical, “Birthday Surprise” is simple, direct and flexible. You’ll find it’s a fantastic way to help make birthdays special and make friends, relatives and clients remember you.